Note: if you choose Art and Theatre, we will need a 40-minute morning break for me to set up the materials, and probably part of lunch break for children to finish their art. 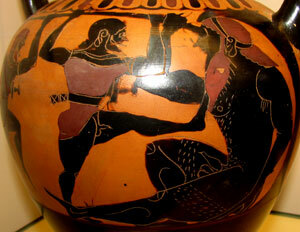 Also the Perseus and Medusa play will not be available for this option. 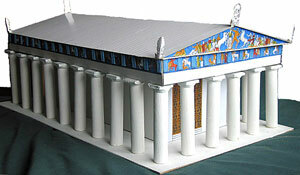 This lesson is a very hands-on way to learn about Greek art and architecture and their influence on the modern world. 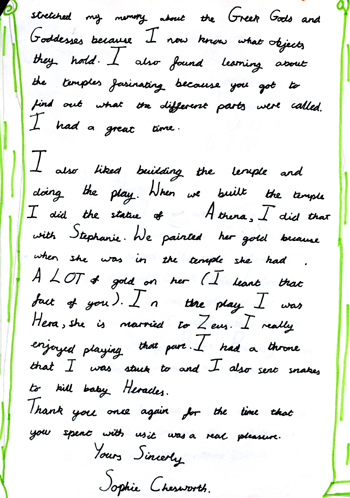 Children will love creating their own works of art, and at the end of the day you can make your own amazing Greek museum. The lesson lasts all day (from 9.30) and takes place in your classroom. 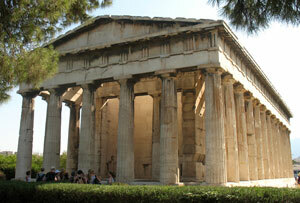 The ancient Greeks gave the world many wonderful innovations, such as democracy, science, astronomy and philosophy. This workshop focuses on three of their greatest gifts: art, architecture, and theatre. Pick two of these to make a full day's workshop. 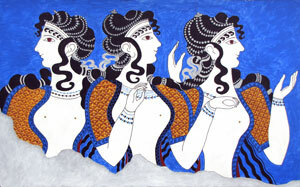 During the first millennium BC Greek art went through such a profound change it has been called 'the Greek revolution'. In Minoan times (around 1500BC) depictions of people and nature were influenced by Egyptian art - colourful, beautiful, but not realistic in a photographic sense. 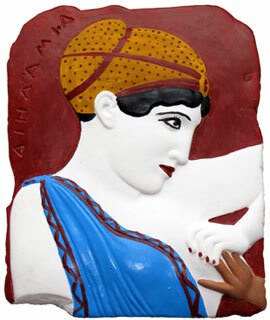 Then, beginning with the Archaic period (around 700BC), the Greeks began to represent life, especially the human form, in a much more realistic manner. 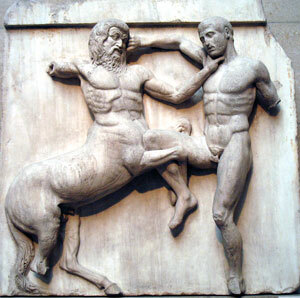 By the 400s, in the 'Classical' period, the Greeks had invented a wholly realistic style which can be seen for example in the famous Parthenon sculptures. Striking poses, believable bodies with accurate muscles and even veins, and flowing, rippling robes, all gave life to statues as well as pottery paintings. This style was developed in later centuries and rediscovered in the Rennaissance, leading to our modern conception of classical art. What many people don't realise is that added naturalism was given to sculpture by painting. Statues and temple reliefs were far more colourful than they appear today in museums. Another important legacy was styles of architecture. 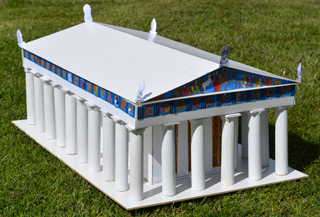 Greek temples such as the Parthenon, with their beautifully modelled columns, pediments, and friezes inspired the Romans, and much later, modern European and American architects. Nowadays most city centres and mansions are replete with Greek/Roman designs, and we associate this style with grandeur, harmony, and a sense of timelessness. In this lesson children learn about these legacies through photos, games, and above all making their own versions of Greek art as well as a model of the Parthenon in its heyday, with full colour and its monumental statue of Athena, plated in gold and ivory. Our third legacy option is theatre. 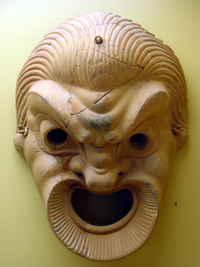 Around 534BC in the choirs singing hymns to Dionysus one man began a dialogue with the chorus. Over time more actors were added and full stories told, although still with singing. Drama was born and a major gift to the world given. Without the Greek invemntion of tragedy and comedy there would be no Shakespeare; perhaps even no movies or TV shows. 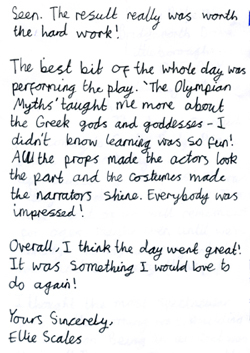 In the theatre session children dress up and rehearse and perform a Greek myth play, with costumes, props and script provided. 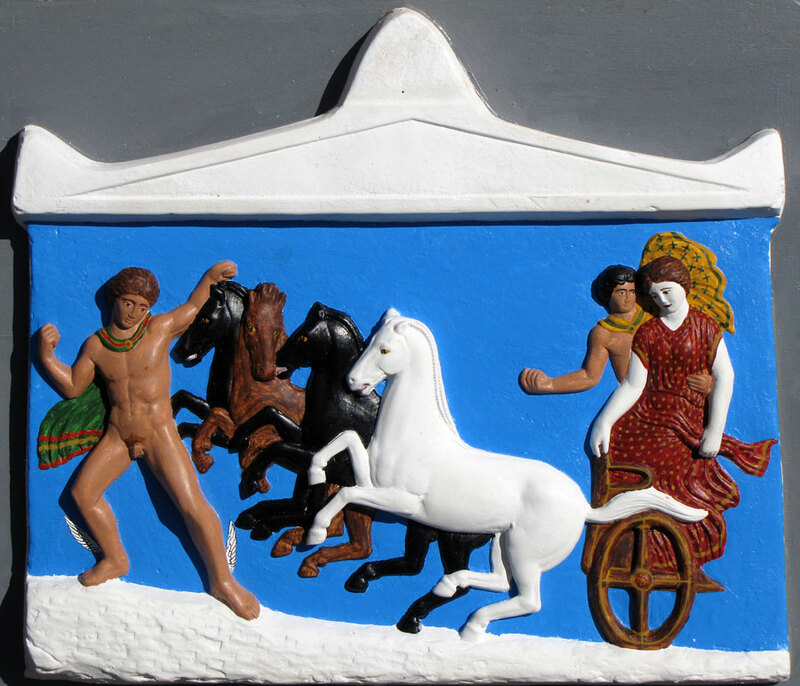 This is the ideal way to learn not only about Greek theatre and how to act, but also the myths, which were frequent subjects for ancient Greek plays. 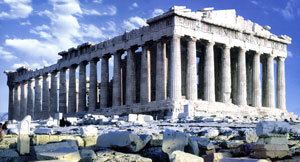 Look at photos of the Parthenon and other temples, to learn about these amazing buildings and their architecture. Learn about the 12m high golden statue of Athena, and the exact copy of the Parthenon in America. 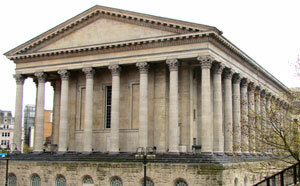 Compare ancient temples with modern buildings to see the influence on modern architecture. Learn about the parts of a temple (column, capital, cella, entablature, metope, triglyph, pediment) and the 3 main types of column (Doric, Ionic, and Corinthian) using photos, paintings and models. Play game using photos: identify the type of column. 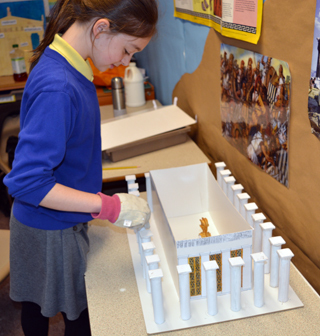 Children work in groups to make the various parts of the temple, with two acting as architects, sticking all the parts together. 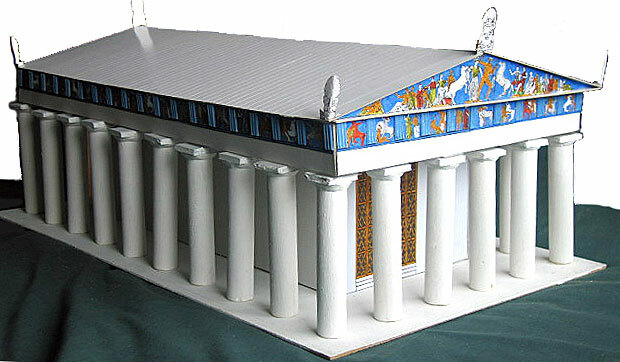 The model is about 60cm long and made from a wooden base, wood, plasticine, foam card and acrylic paint for the columns, and thick white card for the main body of the temple. Because the sculpture was painted, children use felt tips to colour in outlines. Corrugated card is used for the triglyphs. Two children paint a scale model of the statue of Athena gold (see above). 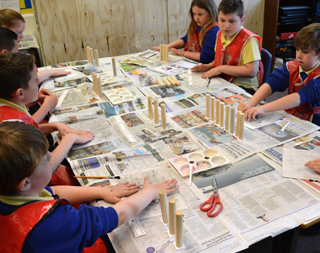 The finished model is very impressive and will look fantastic by the side of your classroom. 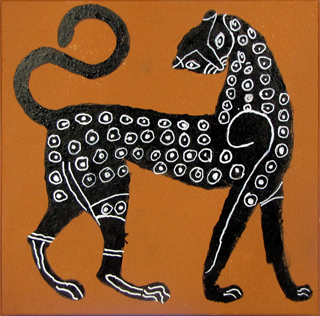 We learn about the styles of Greek art and how they developed through time, by looking at photos. 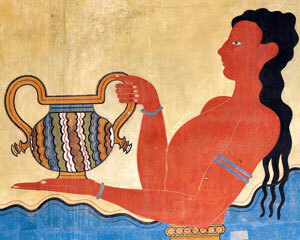 We begin with Minoan frescoes and vase paintings (around 1500BC), from Crete and the nearby islands. 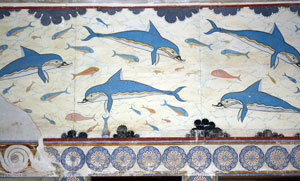 The Minoans were strongly influenced by Egyptian art which showed people from different points of view (e.g. face in profile but eyes from the front). 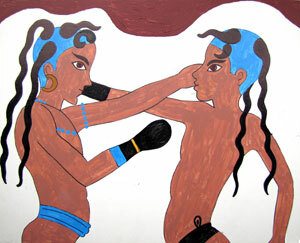 See my own copies of Minoan frescoes here. 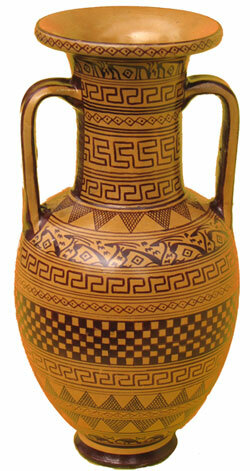 Next we take a quick look at Geometric art (c.900-700BC) in which there was little large sculpture. 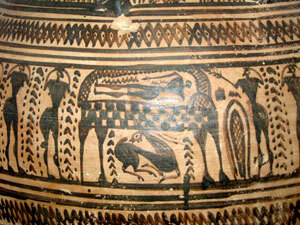 Pottery was painted with geometric patterns and eventually crude stick-figures of people. Third is the Archaic period (c.700-480BC) in which statues of young men and women were carved in an increasingly realistic style. 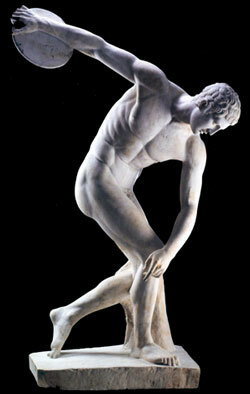 At first the poses were again Egyptian-influenced, very stiff and square, arms by the sides and one leg forward. 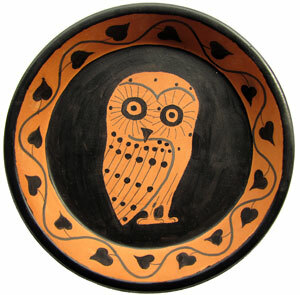 Pottery painting too became more sophisticated. 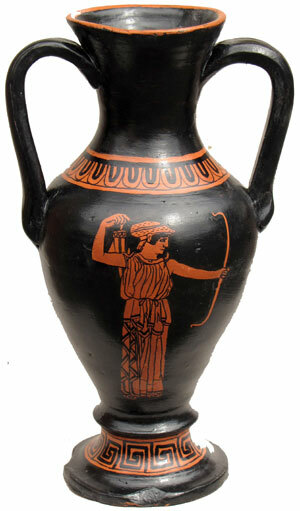 The Archaic period is known for the 'Black figure' style, in which the subject was painted in a clay slip which turned black with firing, while the background remained a clay colour (varying from beige to reddish-orange). Lines were inscribed with a sharp tool and red and white details could be added. 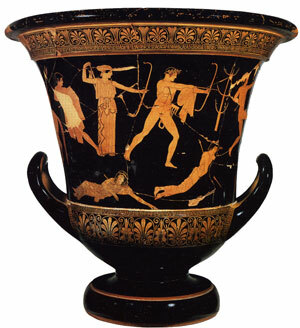 Finally we look at the classical period (480-330BC) in which Greek art perhaps reached its peak. 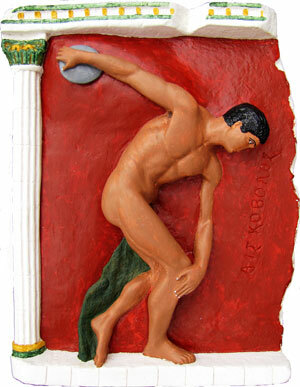 Sculpture was much more realistic, and varied in pose and orientation. 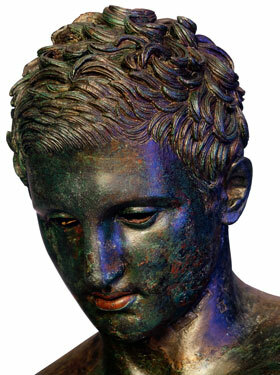 Statues were carved in marble or cast in bronze, although sadly few bronze statues have survived the centuries. 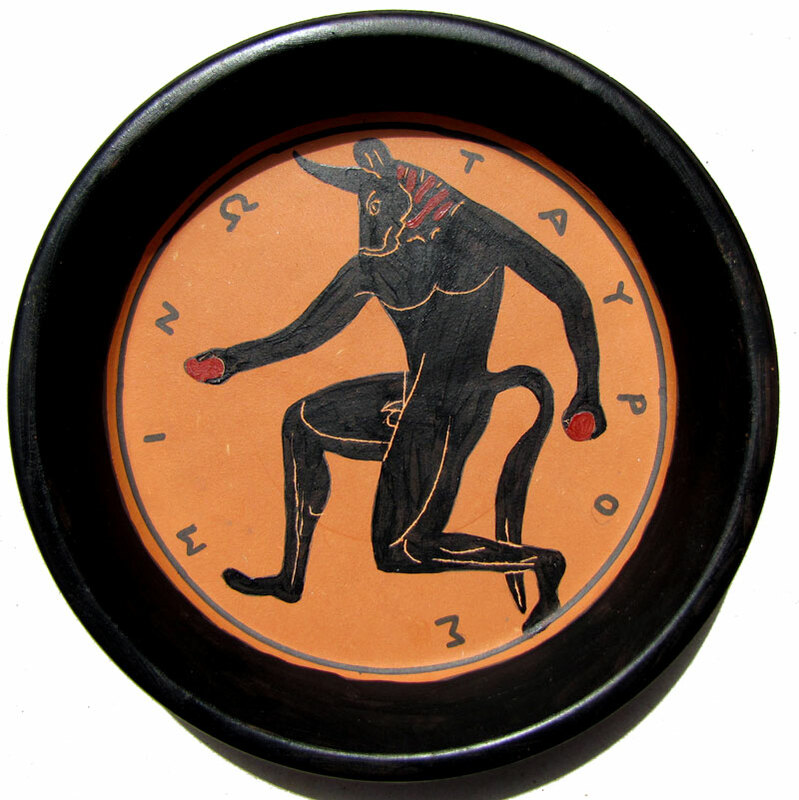 Pottery painting turned to the 'Red figure' style, in which the background was black and the figure left the orange colour of the clay. Lines were now painted very thinly in black, which allowed for more detailed and realistic representations. To help children understand these four styles of art we now play a game. Working in pairs, children look at 7 replicas of Greek art. In each case they must identify (a) the art period, and (b) any gods or heroes (4 are present). 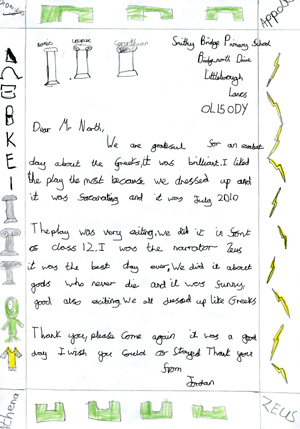 Each child in the winning pair will get a free Parthenon poster. The 7 items can be seen on this page. 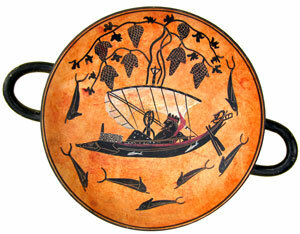 All except the kylix and the geometric vase were painted by me. 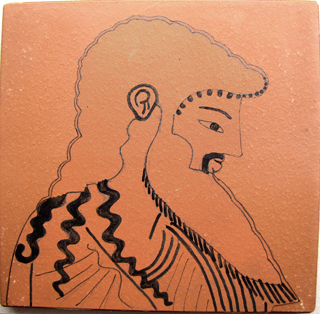 In the main part of the afternoon session, children create authentic replicas of 4 kinds of Greek art: vase paintings on clay tiles (20X20cm, up to 8 provided), kylix (drinking cup) paintings on clay saucers (19cm wide, up to 4 provided), relief paintings (on plaster casts, up to 8 provided), and Minoan frescoes (on 24X30cm wooden boards already painted white, up to 16 provided). An art lesson will be given first, and then careful one-to-one guidance during the session, to ensure children create beautiful works of art. Each child has their own item, with 4 levels of difficulty to suit the needs of your class. (a) Choose a design. 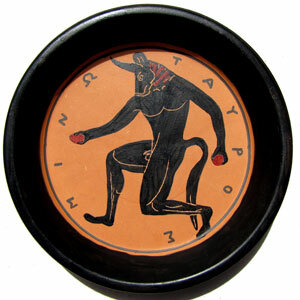 Many options are provided, including both red-figure and black-figure for the pottery paintings. Examples are given on this page but many more can be seen here. (b) Draw round a template in pencil. Then go over the lines with a thin black permanent marker. (c) Do details with pencils first, then marker pens. (d) Paint background colours - black for the pottery paintings. Acrylic paint is used. For the white lines children use special paint pens. On the saucers, lines can be inscribed with a dart. 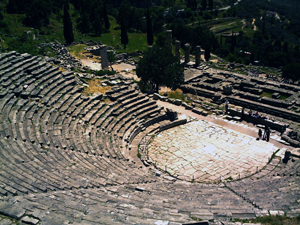 To begin we look at some photos of famous theatres in the Greek world, such as Ephesus in Turkey, Epidaurus in the Pelopponese, and the Theatre of Dionysus in Athens, where it all began. We see the design of the theatres, with their semicircular seating and wonderful acoustics. I have a short video of my wife dropping a coin in the Ephesus theatre, which can be heard all the way up on the top row. If you have a short afternoon (2 hours or less) this section will be brief (just a quick look at photos of Greek theatres). Next the children dress up in authentic period costumes which I provide. 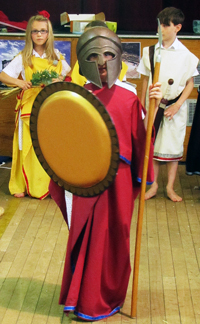 I also give them any props they require, such as Poseidon's trident, or a shield and sword. We then talk about how to rehearse and perform - how to read the script in a clear, audible and entertaining way, and how to mime the actions for the benefit of the audience. We now go into the hall and set up benches in a semi-circle, like a Greek theatre, and position the children to begin rehearsing. To ensure a good performance we will need to go through the play twice. I will direct but I will need at least one adult present to help keep the children on task. Some children will read the script, standing at the side of the hall. They will wear costumes. Other children act, without speaking. This maximises the number of children who can take part in the play. There may however be some children who have not been allocated roles. They can make scenery. You will need to provide resources and an adult to supervise this. At the end of the day we will perform to another class. 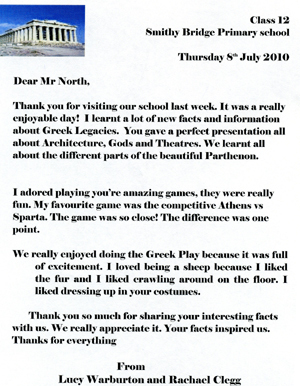 It is best not to invite a large audience as I have always found this impairs children's performance, due to nerves. There are four myth plays. 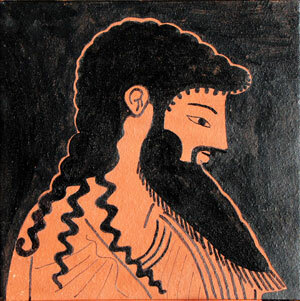 The easiest is the Olympian Myths, a series of short stories about the 12 main gods. 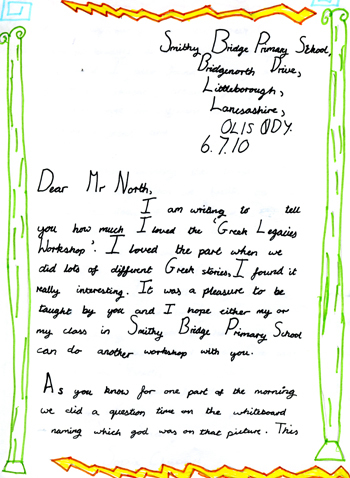 A year 4 class will always do this option, and I recommend it for any lower ability year 5s. You can read the scripts by following the links below. When you book I will ask you to choose a play and I will email the script along with a cast list. 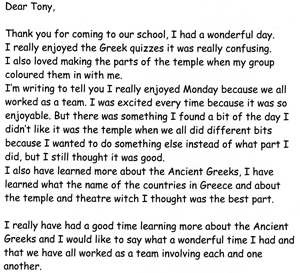 It is very important that you do a read through of the script with the class before my visit, with narrators reading their lines so you can correct any errors. 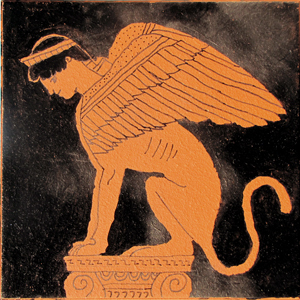 There is a guide to pronciation of Greek names at the end of each script. 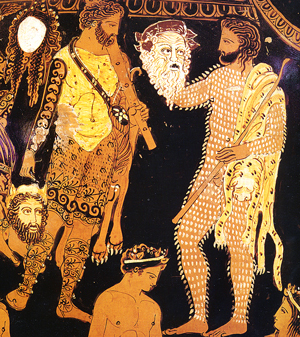 Please note, if you choose the art and theatre option the Perseus and Medusa play will not be available as a choice. 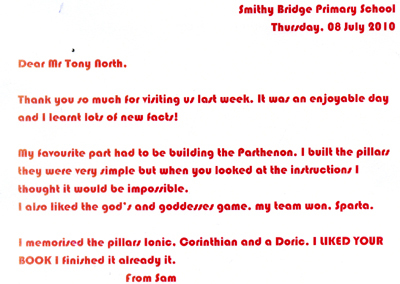 Letters from children at Smithy Bridge Primary, near Rochdale from workshops given in late June 2010 to two year 5s.